Mid-Year task Prompting is here! Improvements for district & school administrators! Virginia customers who need to upload historical data for their students in grades 4-8 can submit files downloaded from the UVA PALS Online System for PreK-3, to be added to student records that you’ve added to our online system for assessment in grades 4-8. Email us at support@palshelp.com for more information. Improvements to score entry processes and Quick Checks! YOU’RE GONNA LOVE THIS ONE, READING SPECIALISTS AND COACHES! : Any PALS Plus task already administered, even if it was an optional task, appears in the “Diagnostic Tasks” section of the Task List after scores were entered to make it clear what tasks have been given. Quick Scoring and Regular Scoring options can now be used on different tasks for the same student without any issues. Example: A kindergarten teacher may enter just the total score for Group Rhyme Awareness using Quick Scoring, but item level data for Lowercase Alphabet Recognition and Letter Sounds tasks, to be able to speed up score entry while still getting item level alphabet knowledge reports. NEW REPORTS and links to parent activities! New Report! The Student Portfolio report combines all of the individual student reports into one handy PDF, so you can print what you need for that parent conference or IEP meeting in one click! New Report! 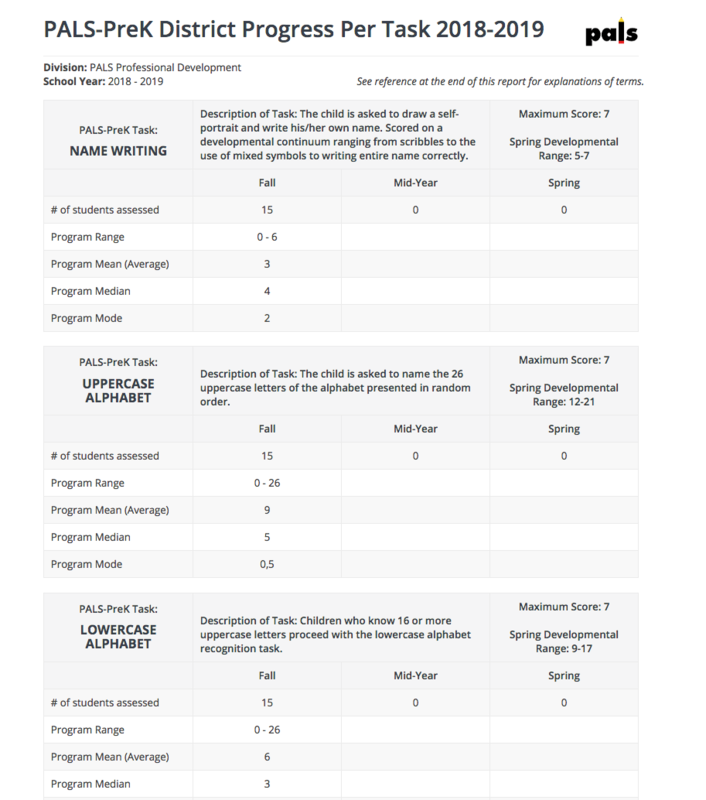 The PALS-PreK District/School Progress Per Task reports help district and school administrators analyze progress across the year for each fundamental literacy skill assessed in your preschool program. New Report! 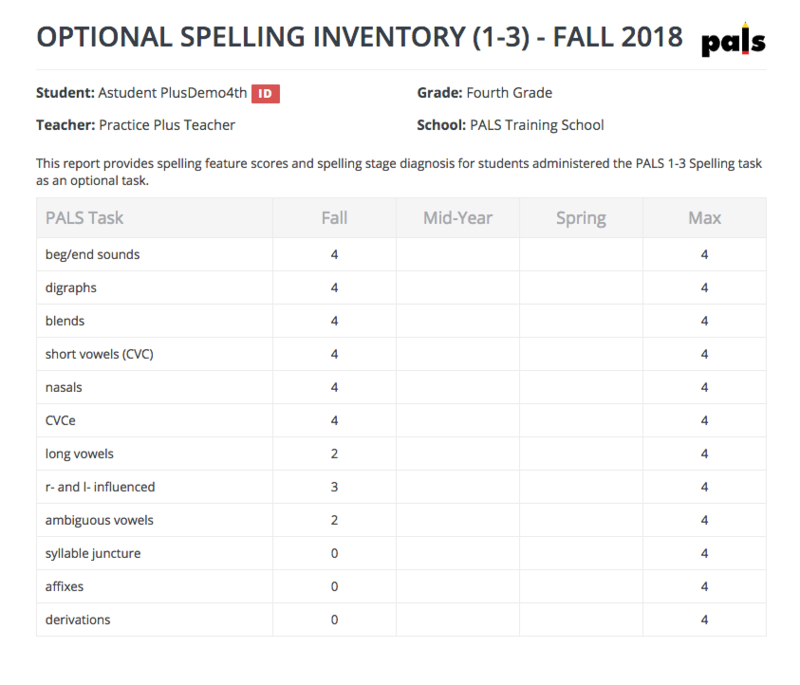 The 1-3 Spelling Feature Scores for students in grade 4-8 who are administered this as an optional task can now be analyzed to determine what Letter Name features may still need to be taught. New Report! 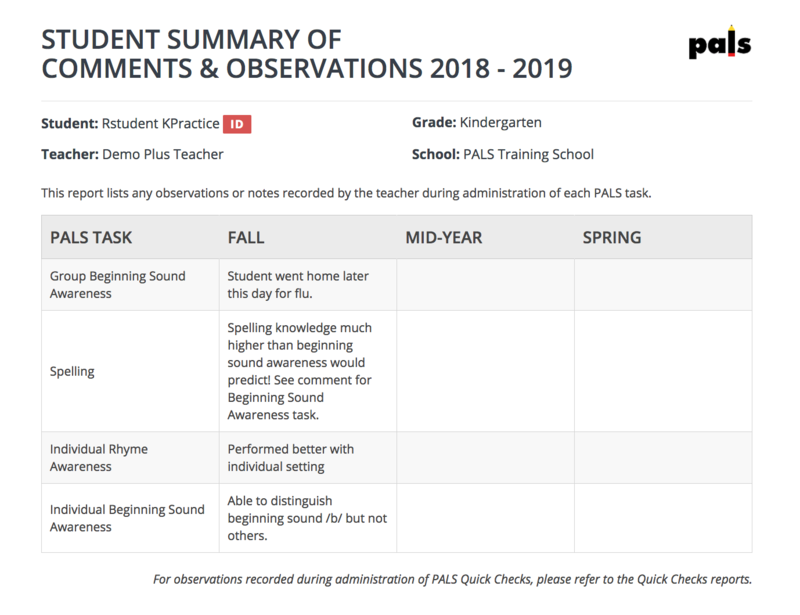 The Student Summary of Comments & Observations report shows any comments entered by any teacher for any task during fall, mid-year, and spring for each student. 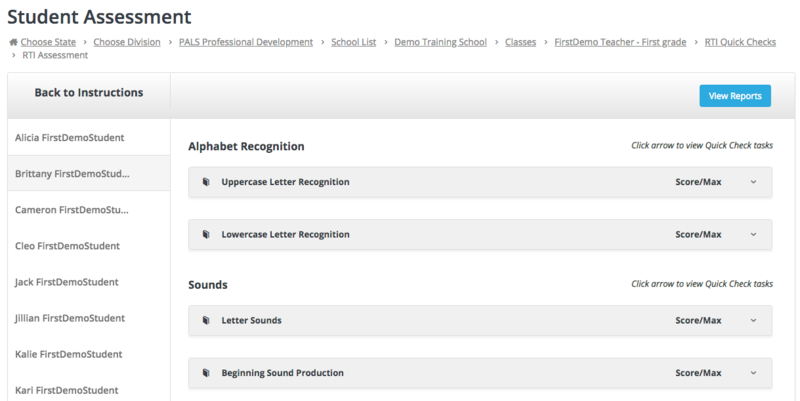 We’ve added a key to the PALS Plus Grouping reports to help teachers translate the abbreviations. Parent Activities to support literacy development at home were added in the spring to the Instructional Resources page.